In Lesson of History Joseph Backstein is showing works by 20 Russian contemporary artists who are the most significant and emblematic for Russia’s contemporary art scene. Anton Ginzburg’s installation Gesamt is the artist’s personal research into the existence of art’s “exalted form” in the era of mass reproduction. In contrast to the German philosopher Walter Benjamin, Ginzburg believes that the course of history is an infinite one-dimensional context of visual fragments of mass culture. When historical and cultural knowledge is proclaimed it is then transformed in the minds of the multitudes in images of pop culture. According to Benjamin, a work of art before the epoch of its mechanical reproduction was entirely dependent on the ritual notional component. Now, however, this component is replaced with mass consciousness and the ease of recognition, something that is symptomatic for the maximum acceleration of the era of WEB-3.0. History becomes pop and cyclical and inhibits the vector of its development. Sculptures made from old Soviet furniture showed the inevitability of utopia. This work harks to the Soviet propaganda poster of 1967 in the very beginning of the Stagnation Period when the reforming social dynamic still continued by inertia, but gradually began to loose steam. The furniture itself, of which the sculpture is made, also dates from that time of the last hopes which were the beginning of the dead-end to stagnation. Nevertheless, the history of the future, according to the artist, can be seen only in the dead-end of the present. According to the ideas of Paolo Virno, which the artist agrees with, if industrial capitalism gave birth to socialism, then post-industrial capitalism will be followed by communism. And if Soviet society was able to reach the utopia of socialism in a short period, then future civilization should go further since Time Is on the Side of Communism. This work harks to the tradition of critical pessimism of the 19th century and creates a powerful metaphor of modern man’s manic cleanliness complexes. This manic complex is directly tied to the historical heritage of western civilization. Germany and many other western societies have built their identity on guilt complexes during the more than half century since the end of World War II. Many geopolitical events that contributed to growing global tensions are based on the guilt complex. Now present on the genetic level, it continues the tradition of oppression and injustice that drives the paradigm of western humanism on which democratic civilization is based. I Wash My Hands precisely diagnoses this historic pandemic, and it tests the level of freedom to avoid responsibility and the ritual suppression of feelings of guilt. With support from the Perm Region Ministry of Culture, Youth Policy and Mass Media. 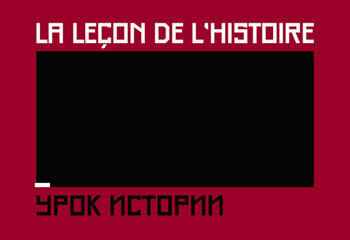 The project is part of the Year of Russia in France 2010, supported by the Culture Ministry of the Russian Federation.